Well, it appears spring has FINALLY arrived here in DC...gosh. SO excited-it has been absolutely PERFECT this weekend! And with the nicer weather, comes more running activities! Since we are now half way through April...here's a little run down of some fun things I've been up to! Late in March, one of our local DC Oiselle Flock leaders, the lovely Courtney, coordinated for our team to participate in a Pure Barre class. I had been interested in trying one of the classes out, so I was definitely onboard. Uhhhh....that hour KICKED my tail! Made me very much aware of how much my core is lacking in strength. In addition to being a great class and fun experience, I was tickled to get to meet some of my fellow Flockmates too! Last weekend, I participated in Potomac River Running Store's Trail Run Series. It's a free group run, held weekly in the month of April. Each week, it's at a different local trail. It was great because they even had water and treats for us at the finish! 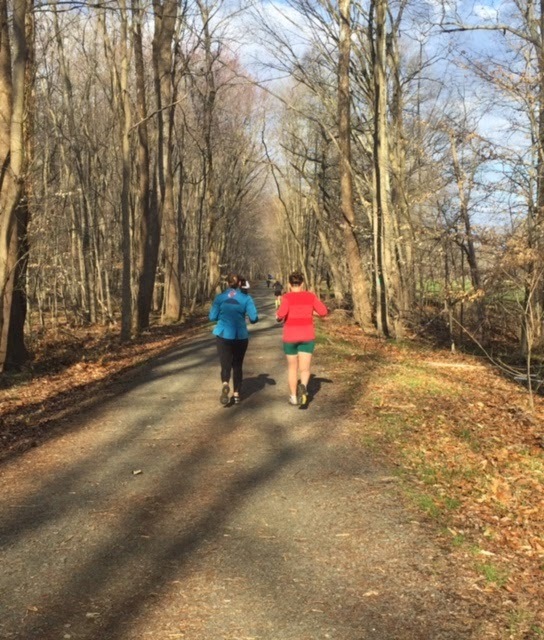 Since this particular run was being held at Algonkian Park, site of our upcoming North Face Endurance Challenge Marathon Relay, several of us decided to venture way out to the 'burbs and check out the trails! It was a SUPER blustery day!! Courtney, Julie and I ran about 35 minutes, out and back. Right at about 6 miles total. I needed to concentrate and not fall over, so no music this time! Just lots of fun catching up and getting to know my teammates better. It had rained the day before the run, so the trail was sloshy and muddy, for sure! I have been watching the forecast for next week's relay, and currently it says 50% chance of rain! I will hope not!! Pre-Race with Oisellers, Taryn, Julie and Courtney, and fellow runner/blogger Deb! The trails run alongside the Potomac River in places! I can only imagine how pretty it is out there in full spring/summer!! This week I was pretty lazy with my mid-week running. I had several things going on at work....including a late night event we were handling for our regional clients....so not much going on with my fitness. Other than my FitBit reminding me just how crappy I sleep! Ha! 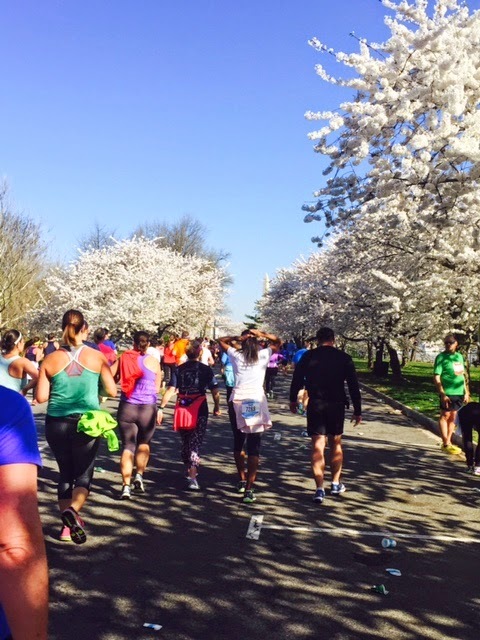 Today, I ran in my second ever Credit Union Cherry Blossom Ten Miler. This year, for apparently the first time in 8 years (!! ), the cherry blossoms were actually at peak bloom on race day! It was absolutely enchanting, really, running amongst them! I was hoping to beat last year's time of about 1:44...but I basically got the exact same time...and the course was even shorter by half a mile this year, due to an early morning accident along the course. Maybe with the GW Parkway Classic Ten Miler coming up, I can beat my time...we will see!! 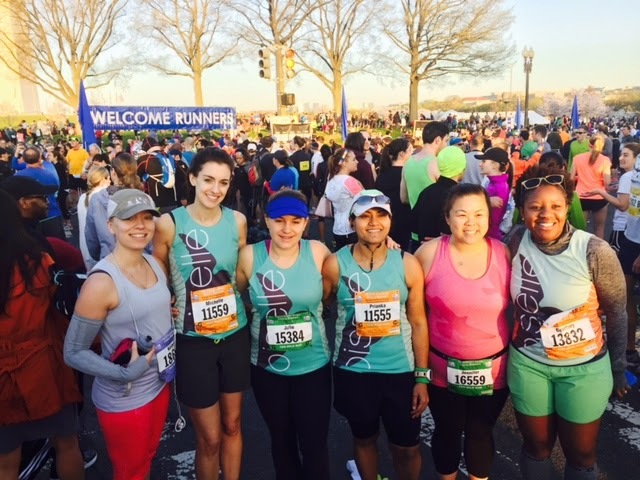 Oiselle ladies - Pre-Race: Excited to meet Jennifer! CUCB Medals have impressed me yet again...how pretty, right?? So there's that! This week, I hope to get back on schedule with mid-week runs and other exercising. Along with the GW Parkway Class on the 26th and the North Face Marathon Relay next weekend, the countdown is on for my return to North Adams, Massachusetts to participate in the Steel Rail Half Marathon. Pretty excited about that one....it's a SUPER flat course, obviously, so maybe I can PR? Plus it'll be a fun weekend with sisters and their guys! AND it'll be another medal from a different state!! What fun!! As a side note, another smaller race that I (along with my guy - can you believe that?!?!) am participating in is on May 3rd. It's the Race for Hope DC 5k. We are running in memory of Blake's Uncle Jeff who passed away in 2011 from brain cancer. Please consider joining us for this low - key run/walk or donating to the cause! How is everyone else enjoying their spring running? How did you enjoy this weekend and it's perfect weather?